The 2017 Frameable Faces Campus Tour Was A Blast! This month we decided it was time to go back to school! Because like, we really miss college. 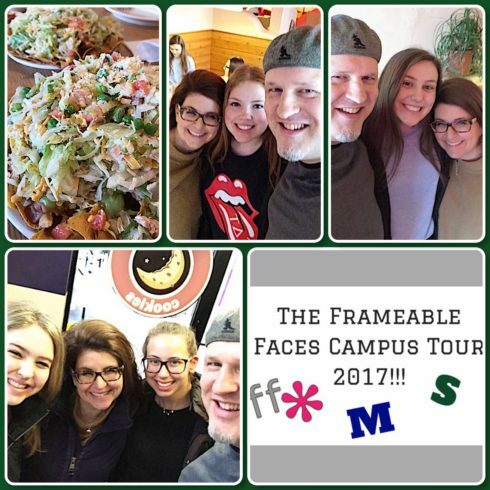 Okay well not exactly – we embarked on the 2017 Frameable Faces Campus Tour which was our third one! We did campus tours back in 2013 and 2015 – not necessarily by design although the bi-annual approach may work going forward. We’ll see since they are pretty darn fun. You see we love our high school seniors and we miss them when they go away! They often visit when they come home but we like to head up to Ann Arbor and East Lansing once in a while to see them and feed them – college kids love food right? We get to reconnect with them and find out what’s going on in their lives and their parents get to see that they’re alive and well! Haha! 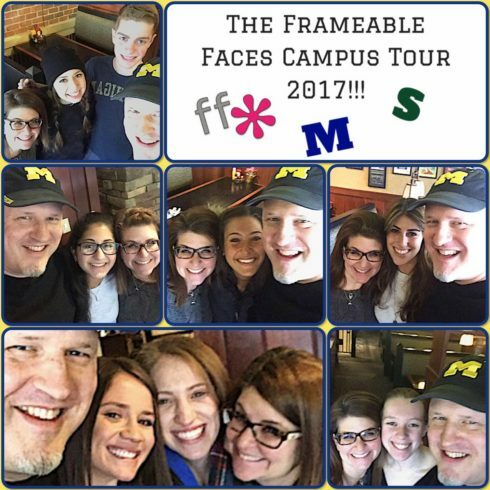 2017 Frameable Faces Campus Tour – First Stop, Michigan Wolverines! GO BLUE! Lastly we walked around and gave our Periscope community a little tour of central campus and one of our seniors Becca made another random cameo – so fun! Sparty On! 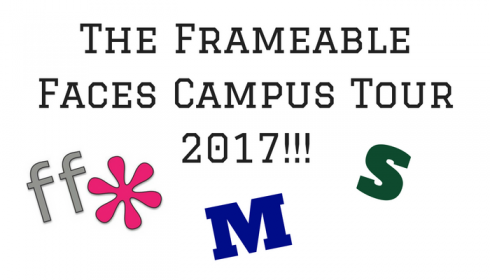 The 2017 Frameable Faces Campus Tour Rolls Into East Lansing! Now we have to put a disclaimer on this… we thought heading up to MSU on MLK Day would be a good idea because the University was open but there were no classes. And that would have been a great plan. What wasn’t a great plan was not checking the weather, because had we done that we would been aware of the freezing rain that came down most of the day. Not kidding – we saw over twenty cars in the ditch on either side of I-96 on the way up to East Lansing. The weather put a slight damper on the plans – we didn’t get up there early enough to do a snap story around campus like we did in Ann Arbor and our turnout wasn’t as big. BUT – we didn’t let that stop us from having a great time anyway with a few of our faves! Here’s our Snap Story with our selfies, topopo salads & Insomnia cookies! And that about sums up the tour! We had so much fun visiting with our former Frameables and it’s such a thrill to see them thriving and learning up at school! We wish we could get to all of the other schools too but time and logistics make it impossible! Suffice it to say this is how we feel about all of our former seniors!!! We hope you enjoyed the highlights of the 2017 Frameable Faces Campus Tour! Shira Soars Over Detroit City For Her Senior Pictures! “Shira Soars Over Detroit City” definitely tells the story of this senior session! 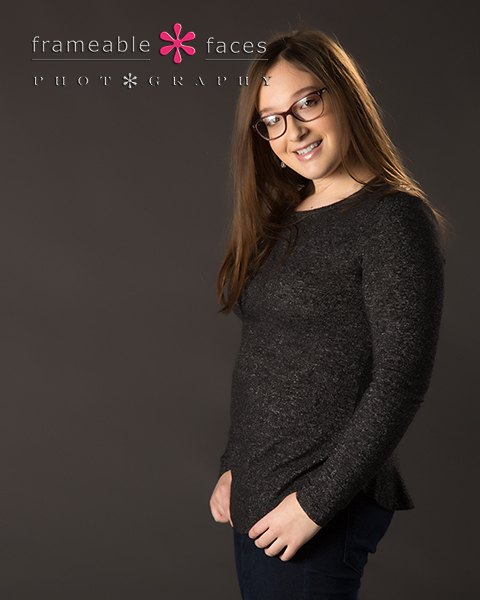 We’ve actually known Shira for a while because we’ve photographed her siblings and a family portrait that she was in here at the studio a few years back. 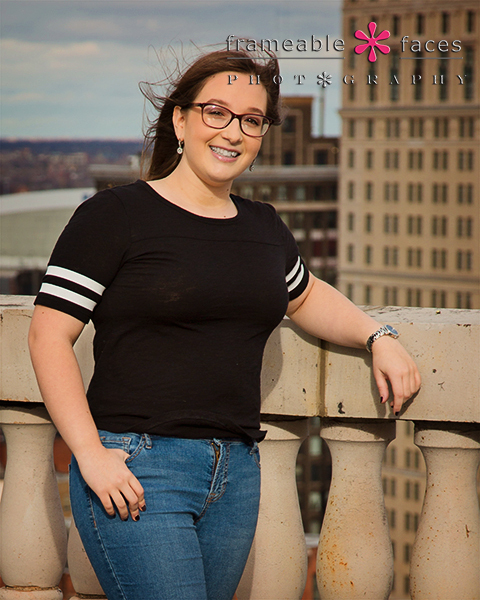 But Shira’s session took on a whole new approach from the others because we had access to some space and even a roof high above the city of Detroit! So cool! Meanwhile Shira is a sweetheart and she looked so cute for her session! 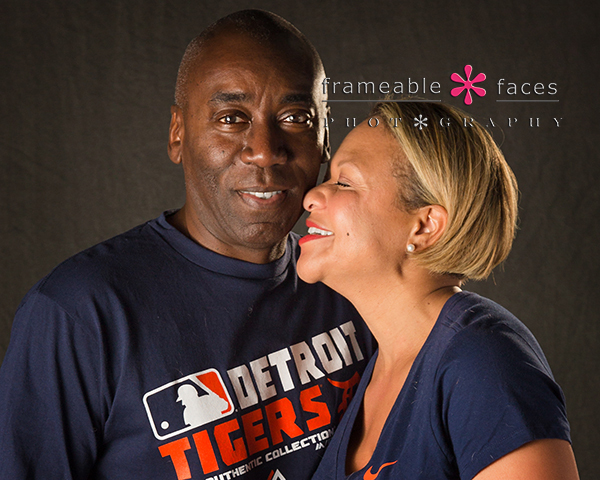 We actually did half of the session downtown in Detroit where her dad met us to get us the access I mentioned, and then we finished up back in the studio, so we’ll highlight a little of both starting with “The D”. We also have some behind the scenes from up top as well from the replay of our Periscope broadcast – you can follow us there at @FrameableFaces at this link, or if you want to just follow on Twitter and watch there you can do that too! Next we headed up to the roof where we captured this one of Shira – “soaring” above Detroit! And there you have it! A great day in the city and the studio with Shira for sure. We hope you enjoyed the highlights of our day with her! 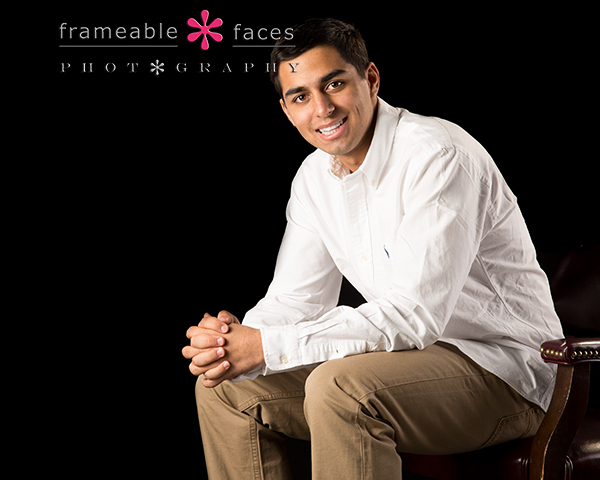 A Short, Simple and Super Senior Session With Jason (and the fam)! Sometimes waiting until rush hour dies down before you head to your destination isn’t such a horrible idea right? Well the bulk of the class of 2017 rush of seniors is over (until the late spring rush that happens every year) and these next few seniors we will be highlighting were able to slide in on the back end of the rush. Not a bad way to go! 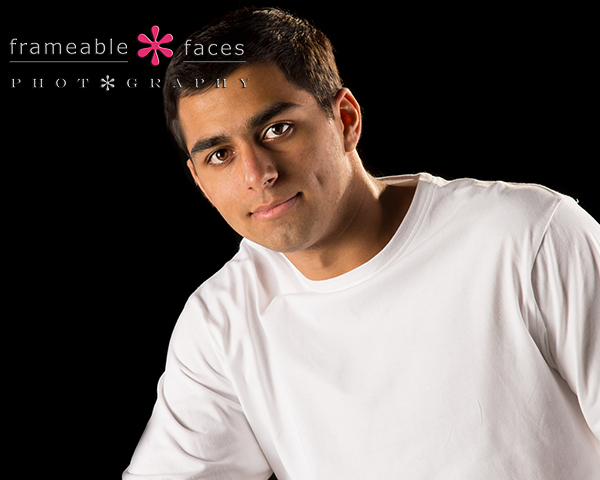 And in Jason’s case he is a legacy Frameable – that is his brother Ryan was here for his senior session a few years ago, so we were happy to get the return call! And as a bonus the whole family was slated to come back and jump in for a photo or two so while we kept this one simple, we still kept it super – a short simple super senior session (say that five times fast)! 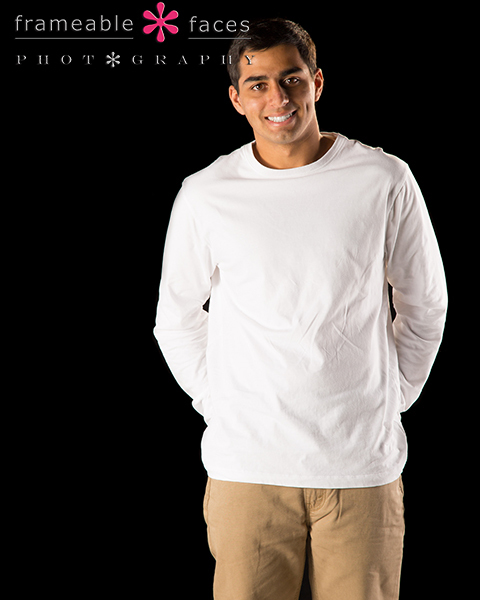 While we did use the grey backdrop mainly for the yearbook headshot we went with black for the rest and that’s what we’ll focus on here for Jason until we sneak peek a shot of the fam jumping in a little further down in this post! Now that’s a good looking kid! We also have some behind the scenes fun for you from the session with a replay of the Facebook Live broadcast we did when the rest of the fam jumped in for a couple! 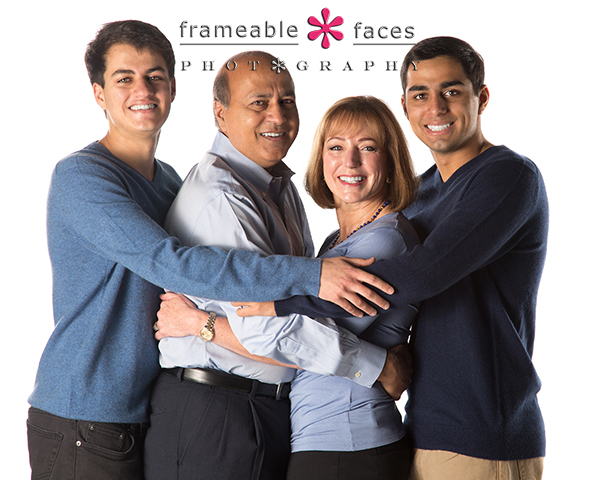 And here’s one of the resulting family portraits on the white background – the family hug! Great family! So there you have it – a short, simple and super senior session indeed (with the fam)! We hope you enjoyed the highlights! Neil Is Back, He’s Two, And He’s Still Pretty Darn Cute! Neil was pretty darn cute when he was here as a little bitty baby, and – no surprise – he’s still pretty darn cute as a two year old! 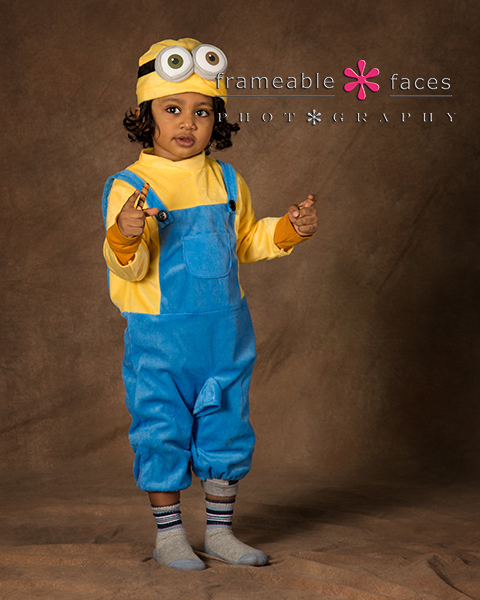 He came back to the studio with his minions even though it was him who was dressed as one! 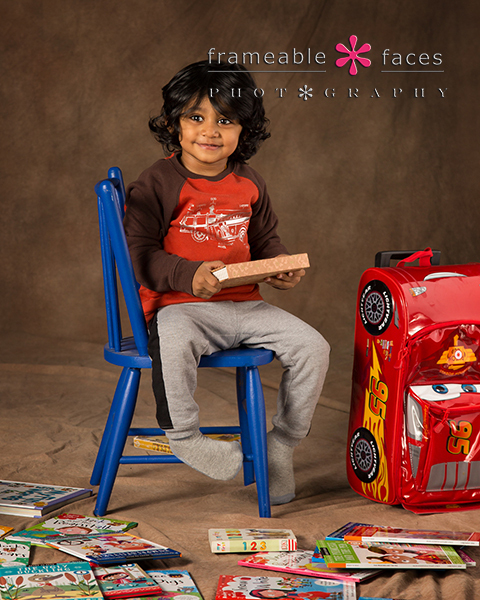 Haha… Parmesh and Nalini are great – we laugh quite a bit when we’re together here in the studio and we had another winning session this time around with different outfits, plenty of toys and plenty of food too! We also have some fun behind the scenes action from the session with our replay of our live Periscope broadcast! You can follow us on Periscope at @FrameableFaces at this link to join in the fun or you can also watch from Twitter at this link! Now let’s get back to a few more photos shall we? Love that one!!! “Pretty Darn Cute” is pretty darn accurate wouldn’t you say? 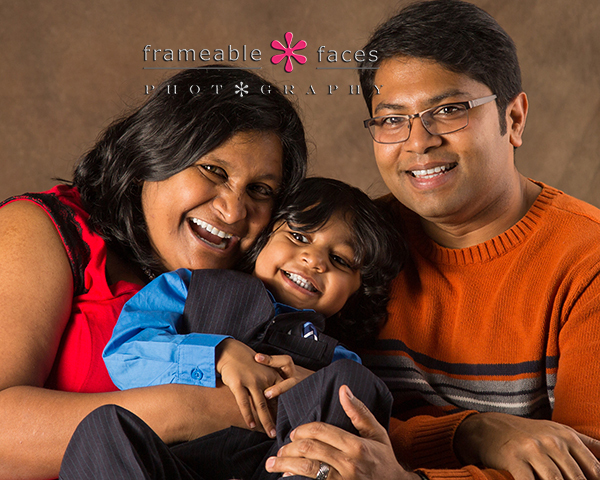 That’s a happy kid with plenty of toys for the session…..
And how about a family shot to close it out? So fun!!! So there you have it! Neil was back and he’s still pretty darn cute. We hope you enjoyed our highlights of our day with them! 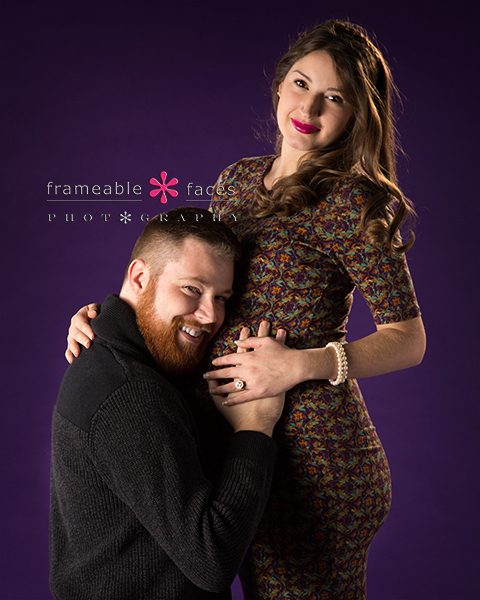 The “First” Frameable Faces Fam Baby Is On The Way! Okay so let me explain… Many of you know our event photographer Angela aka “Nikon Girl”. Angela has been with us since she walked into the studio on February 11th, 2011 asking if we were looking for a photographer. She was still a photography student then but she had her little portfolio with her and Ally saw something in her photos, so we kidnapped her that very day and took her on location with us. She just fit. She’s always just fit, and she has grown so much as a photographer (even though she shoots with Nikon….haha – as you know Ally shoots with Canon)! She has captured so many amazing moments for our clients at Bar & Bat Mitzvahs, Communions, Weddings, and various other parties and events! Meanwhile she has grown in other ways too – like personally! She’s expecting a little one with her fiancé Cam now and so here we turn the tables and make Angela the subject of a photo session here on the blog! 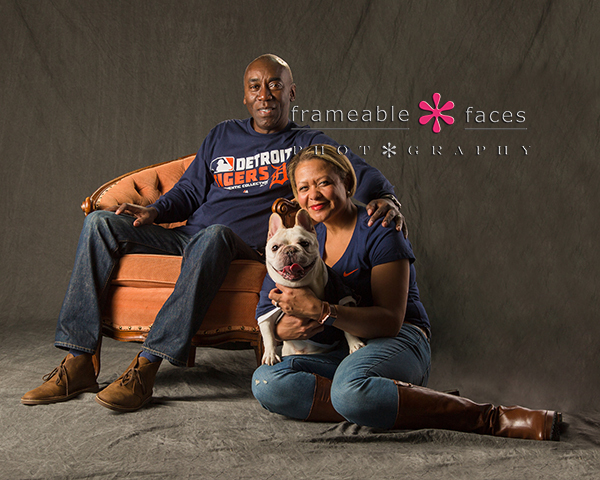 The first “official” Frameable Faces Fam baby is on the way! 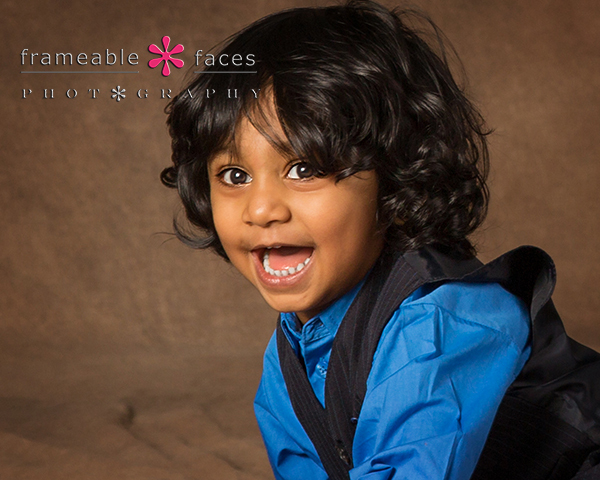 Frameable Faces Fam Baby On The Way…. Oh – and it’s a girl! 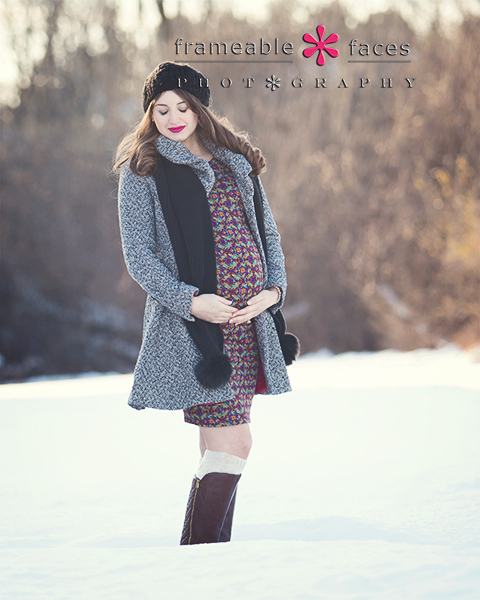 So here we go – this maternity session was just the cutest and a bit surreal too! So beautiful – love the half black and white filter on this one… so serene. We spent some time in the studio first and Cam jumped in for a few too! We also have some fun behind the scenes action for you – first we have the replay of the live Periscope broadcast that we did on our Tuesday afternoon show on ParachuteTV1 which was the very first network of its kind on Periscope. Our show is every Tuesday and it’s a photography show at 2 PM EST called The Photo Shop! You can follow ParachuteTV1 on Periscope here, or you can follow our own @FrameableFaces channel and be a part of the fun here. Let’s get Cam into the picture now shall we? How fun are they? Loving the purple too! 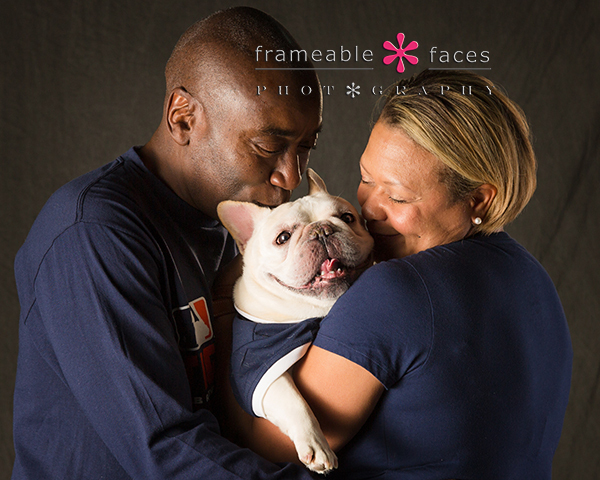 So we’ll leave you with one more photo – one of our favorite maternity shots we’ve ever done I have to say…. 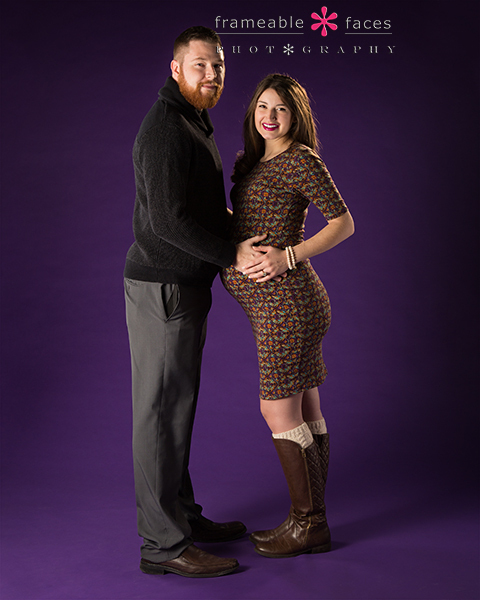 Angela is beautiful in every way – inside and out and she is going to be an amazing mommy. 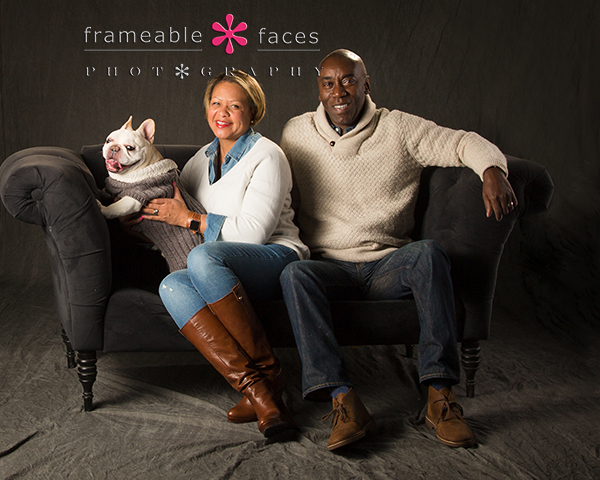 We can’t wait to meet the baby – the first Frameable Faces Fam Baby! We are so proud of our Nikon Girl and so happy for her and Cam! We hope you enjoyed the highlights of our day!